Dijks en Bijks: Like Christmas in November! Today was a glorious day. We awoke and biked to the Zuiderbad, an indoor swimming pool located near the Rijksmuseum, where we purchased a 50-swim "punchcard" of sorts. More on Zuiderbad in a different post, but it is great to have finally chosen what seems, after our first visit, to be the perfect pool. Now all we have to do is find our soul-mate running group, and it's off to the races! We detoured down to the Olympic Stadium to pick up our race packets for tomorrow's Stadionloop 5k, then pedaled back north via the Vondelpark and Albert Cuypstraat Markt, where we snagged some tomatoes and bread. Following a massive brunch of egg/Italian sausage/fresh basil/tomatoes/goat cheese/bread/tea, THE DOORBELL RANG. And then, oh then, came true happiness. There's a stowaway in this lineup. The Halloween card in the upper right was actually from my mom. Those shoes were the other major excitement for me. What are they? They are my new Scott t2c's! This will be my first time going "back for seconds" on any running shoe. With the exception that this is the women's version of the yellow-and-black t2c sold to [a very skeptical] me in late 2009 at the former Seattle Running Company. I ran in those yellow shoes until the sides ripped out and the rubber wore off the soles. 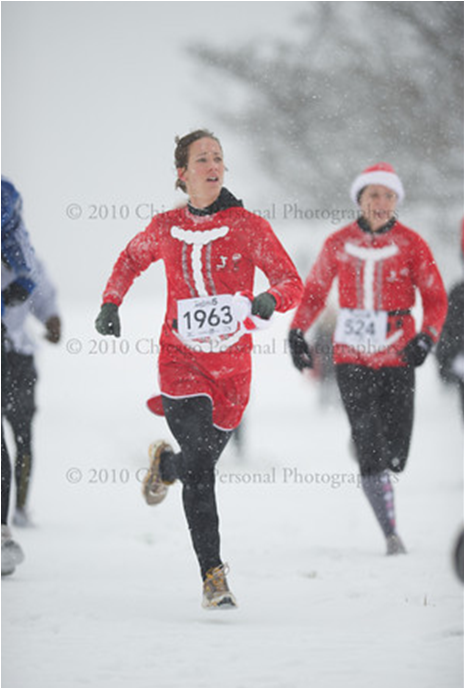 I ran in half marathons (trail and road), snowy Chicago 5k's, three triathlons, CrossFit workouts, and training runs. For over two years. t2c: in the snow, ca. 2010. Side note: I am wearing the tights in this photo, right now. Did you notice the part in the shoe review, linked above, that says it's designed as a racing shoe? For this, I was skeptical prior to my initial purchase. I was looking for a trainer, not a racing shoe. At the time, I was nursing what I think was probably a stress fracture in my foot, and not running at all. After 6 weeks of no running, I limped back into it wearing these, and discovered that running on my forefoot reduced the pain. After fully recovering, I eased back into a midfoot/forefoot strike, but my stride was definitley altered. I've been running ever faster, ever since. Thank God for the wild-eyed ex-college-athlete Capitol Hill shoe pusher who convinced me to buy those bright yellow tc2's. I am sure looking forward to more miles in these new blue babies. And thank God for the baking soda Ed's mom sent. We can't find it anywhere in this city. Ed took that baking soda straight to the kitchen.